Whether you want to kick off a fabulous date night or wrap up an enjoyable afternoon, this two-hour sunset sail is just the ticket. Step aboard the gorgeous traditional vessel to take in the sights at the most bewitching time of day. You'll sail past Alcatraz, hug the coast at Sausalito and experience the full grandeur of the Golden Gate Bridge. 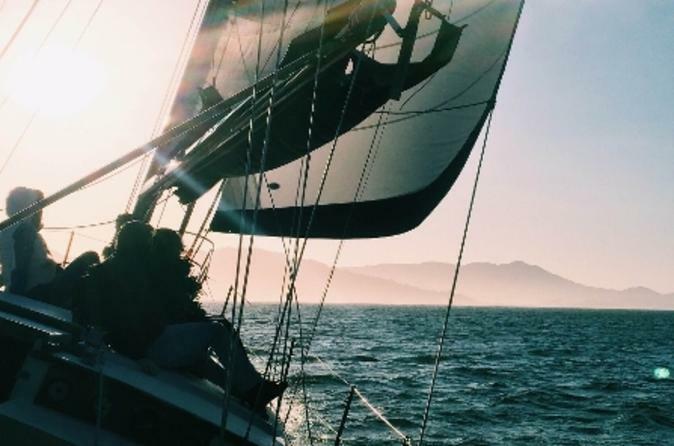 Sip two servings of your choice of included beer, wine, soda or water as Privateer cruises along the spectacular San Francisco cityscape, while the sun sets and the lights of the city come to twinkling life. You will sail out past Alcatraz and Angel Island, catching great views of both islands and the Bay Bridge. You will see the lush green landscape of Marin illuminated by the setting sun and the charming and picturesque city of Sausalito. Then you will sail parallel to the Golden Gate Bridge for some beautiful sunset photo opportunities. As you head back toward the docks at Pier 39, you will see the San Francisco waterfront begin to light up and sparkle!